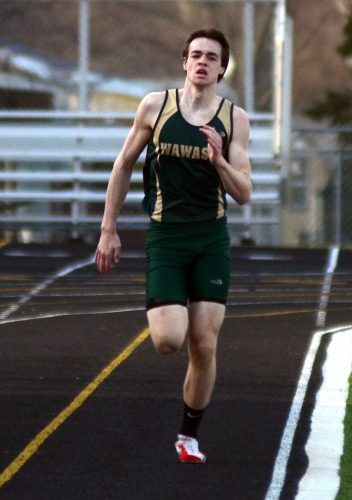 Wawasee’s boys track and field team finished 16th at the Fort Wayne Northside Invite Saturday. Carroll won the meet with a score of 120 ahead of runner-up North Central’s 102 and Homestead’s 95. Wawasee put up six points. Brandon Kidd finished ninth in the 1600 meters in a time of 5:03.99. The Warriors’ 4×100-meter relay finished eighth, its 4×400 relay of Jaydon Boyer, Michael Hammer, Spencer Hare and Thomas Conley were seventh in 3:50.87, and the team’s 3200-meter relay placed fifth in 8:39.18. Complete results from the meet were not available. The Tigers took to the track in one of the premier sprinting events in the state of Indiana in their first away meet at Lafayette Jefferson High School. The Tigers were led by the 4×400 meter relay team of Tanner Stiver, Keagan Larsh, Eli Owen and Alijah Wade. The team was able to make their way to the podium, finishing in sixth place. Other athletes that represented the Tigers well were Jayton Brock in the 200-meter dash, Tanner Stiver in the 400-meter dash, and the 4×100 relay team which consisted of Alijah Wade, John Culbertson, Eli Owen and Mason Martz. The Tigers will be back in action Thursday, April 18 as they take on Northern Lakes Conference foes Wawasee and Northridge at home. Field events start will at 5:30 p.m., and running events at 6 p.m.
Grace’s track and field team enjoyed a wealth of success on Saturday at the Huntington Invitational. The Lancers claimed 10 titles at the meet. Grace’s men’s team finished second out of four, while the women were fourth. Nordia Campbell was part of a pair of first-place finishes for the Lady Lancers. She won the 200-meter race in 26.54 seconds and helped the 4×100 relay (Julia Malson, Alexis Williams, Suzanne Sickafoose) to another first as they finished in 50.80. Sickafoose also placed third in the 100 (13.01), and Kylie Sandquist was runner-up in the 100 hurdles (17.36). Dylan Felger and Kyle Smith won a pair of races. Felger won the 200 with a time of 22.37, and Smith won the 800 in 1:57.02. They teamed up with Jonathan Balda and Martin Schiele to win the 4×400 relay (3:23.46). Isaac Brown had a busy afternoon, winning both the high jump (6-feet-4.25) and the triple jump (42-8). He also finished fifth in the javelin toss. Thomas Hickerson won the javelin with a throw of 170-1. Walker Hobbs also claimed a throwing victory for Grace, winning the shot put (57-5.25) while finishing fourth in the hammer. Ben Rankin was first in the 3,000-meter race (9:16.83), and Korry Hamlin was second in the 1,500 (4:07.86). Caleb Brown placed well in three events, finishing second in the hammer (151-8), third in shot put (45-4.25) and fourth in discus (129-6). William Shafer was third in both the discus and hammer. Paul Brawner finished third in a pair of events, posting 11.03 in the 100 dash and 22.62 in the 200. Other men’s runners who also had top-five showings include: Schiele (100 dash), Balda (800), Luke Smith (800) and John Marhefka (1,500). On the women’s side, Brooke Treadway (discus), Makenzie Adams (800), Bethany Hoffman (javelin) and Kaitlyn Mack (400) all had finishes in the top seven. The Lancers have two meets remaining before entering the postseason. Grace heads down to Marion on April 20 for the Little State Championships.